Solar panels. What a beautiful invention. Machinery capturing the all-natural light from a round burning ball of gas called the sun. These magical panels have the ability to convert energy radiated in the form of light and switch them around in a miraculous series of events to create electric energy. How do they do this magnificent act, and why does it matter? UH Hilo has been known to be cultivators of the environment, as Hilo is a prime location to honor the natural beauty found on the island and within the state. The university helps to care for the Earth by promoting healthy endeavors to preserve the land, such as recycling, reducing, reusing, composting, and much more. One specific topic of late has been solar panels around school. In addition to the library, “photovoltaic (PV) systems can be found at the following buildings on campus: PB11, Sciences & Technology, Campus Center, College of Hawaiian Language, Student Services, CoBE, Theater, & Mower Shed,” says Michelle Agbigay, who works for Facilities Planning and Construction. The library first began implementing photovoltaic installments in late 2014 to promote environmentalism and to utilize a better light system. They were installed under a larger project which was managed by the UH Office of Capital Improvements at the time, but now has changed its name to the UH Office of Project Delivery. This project works to improve the campus through construction and by repairing certain maintenance issues. Natalie Gillette, a freshman, states: “I really like the initiative the school is taking in incorporating solar panels and encouraging sustainable energy practices.” It certainly is a great thing to have students who are passionate about helping the planet in any way possible. That is why UH Hilo has the SOS club, or Students of Sustainability. They put on zero-waste events and work towards making the campus a healthier, happier place. In addition, they bring environmental awareness to students and provide alternative ways to manage trash. “As a student, I feel like having solar panels on campus is really good, especially if they reduce the amount of electricity that we use,” SOS Secretary, Mary Fem Urena, clarifies. Around the university, solar panels are generally seen as being beneficial and invoke a positive reaction when they are brought up. 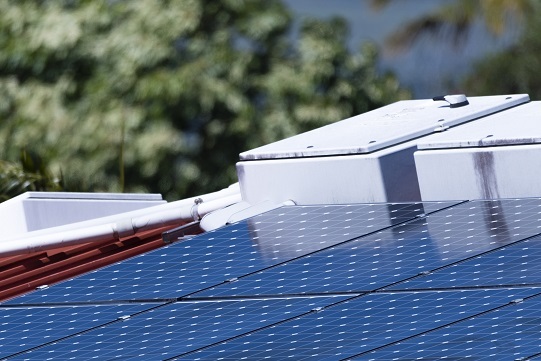 In the past, the library experienced difficulties with installing solar panels, due to billing and deductible issues with electric companies such as HELCO. After installment, Facilities Planning and Construction found it tough to gauge how effectively the panels were running. But recently, the library has been able to set up a more efficient way of using the PV system to capture light and transform it into energy. Now students can utilize the library with ease, knowing that many of the photons illuminating the library were received and perceived in an entirely natural way. If you find yourself particularly intrigued by this topic, be sure to check out the SOS club, and feel free to talk to Auxiliary Services with any other questions or comments.